WARNING: This may be the most masturbatory post in the history of this blog. Inspired by Alex's season recap, and my modest desire to be a real athlete, let's take a look at this past ski season and the upcoming mountain bike season. Tuesday night sprints: 6th, 8th, 6th, 10th, 2nd, 4th, 2nd. This year's ski season was vastly different than last year's -- this year I trained less, rested more, and raced less. The result was skiing way better than last year, and skiing way worse than if I trained year round, or even just fall-round. Another Monday has slipped away without me getting a race report up. I realize that solo needs reading material, so here's what happened this weekend, slightly delayed. If you read what Alex did this weekend then nothing I say will be news to you. 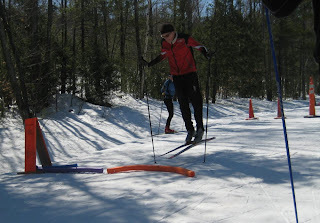 Saturday was the Gunstock Spring Fling F1 race. What is an "F1 Race," you ask? It's something the crazy Russians at Gunstock made up, because cross country skiing for a long time in the woods by yourself is stupid, and racing around in little circles is way cool. If you think I'm joking, don't forget that I ski at Weston. 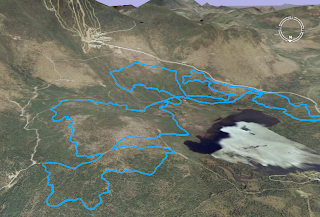 So Gunstock had a 10-lap race set up with 700m loops, which were both hillier and longer than a Weston lap. In between each loop you had to make a pit stop to change skis, so you ultimately skied 5 laps classic and 5 laps skate. To make things even more motorsport-ey, we all did a "qualifying lap" to get spots on the start grid, and they added a cone chicane on the backstretch. Saturday morning I woke up. My throat was sore. Really sore, just like it had been the last 3 mornings. I thought about the situation for a while and decided it was time to do the smart thing that is so hard for a racerhead like me -- skip a race I had preregistered for. "I'm not going to race Sugarloaf," I told Linnea, "I'm too sick." "Ok," she said, "I'm going to go anyway." She used to work at Sugarloaf, and was volunteering at the race. And with that, my fate was sealed. I can't sit around the house for a weekend, so I have to go with her. And if I go with her, I'm going to end up at a race that I'm already entered in. I can walk away from a race that's 4 hours away if I'm sick. I cannot walk away from a race that's happening right in front of me. The Stowe Derby is pretty insane, but 500 people do it, so it can't be that bad. 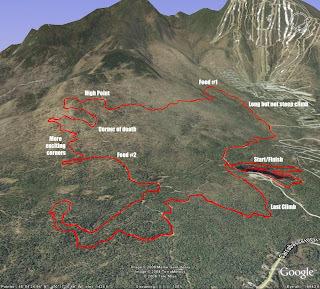 Well, 30 people did the Sugarloaf Inferno, because it is that bad. The day before the race Sugarloaf got over an inch of rain. The day of the race, it was so windy that all but 3 of the lowest lifts at the alpine area were closed -- including the lift we needed to ride to get to the start line. Thus, 9:45 found me standing outside, in a 30mph wind, waiting in line to board a snowcat, to go up on a mountain that had just been turned to a sheet of ice -- with my freaking cross-country skis! The mood among the racers was a mixture of apprehension and impatience. Let's get up there and get this thing done -- am I gonna die? 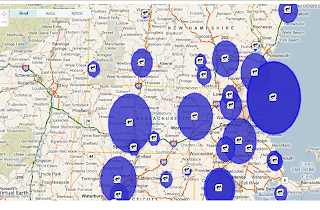 Hey, is that a map of every cross race in New England, with circles indicating the amount of participants?? The King of Burlingame MTB TT is only a month away and only has 38 slots left (62 people already registered). It's only an hour away from Boston and a $17 entry fee on April 6th -- sounds good eh? Plus it's a rare chance to take on such "legendary" MTB riders as GeWilli and the King of Yogurt. It will probably fill up, so get over there and register while you still can, or don't come crying to me when your April 6th is SUPER LAME and not at all BIKE RACEY. I just read Alex's writeup and she basically took all the adjectives I was going to use to describe the conditions last night. In summary, it was pouring and hadn't been below freezing in 48 hours. In typical Weston fashion they groomed and tilled it anyway to make some pretty corduroy slush that didn't hold up at all. The untilled ice was way faster, but other people seem to like slush and/or get surprised when it doesn't hold up. Thanks to mostly luck I had a pretty good run. I finally earned a front row start and got into the first lap in second place, which is basically first place since Bret quickly skied away like always. After the parade lap I pulled aside to let Dave Currie come through, and when I looked back there was a 10 yard gap behind him. The forecast was for 6-10 inches of snow during the race. I haven't done a skate race longer than 50 minutes all year. And yet, before the race I had convinced myself that a skate 50k in a snowstorm was going to be fun -- or at least, epic. Was I right? Let's find out! It was snowing hard when we got up, and it took over 2 hours to make the 74 mile drive to the race start over the most frost-heaved road in Maine. Linnea somehow managed to sleep on the way despite the car being periodically airborne, which shows you how laid back she is about ski racing. Parking was full, so we got sent two miles up the road, theoretically to return via shuttle -- although the shuttle never really appeared and we fortunately got a ride down with Alex's boyfriend Ed. To make a long preamble short, I ended up skiing exactly 50 yards to the start line to warm up, and I was basically the last person to make it into wave one... although at least I made it!